After experimenting with an UnUn fed long wire and having less than stellar results, I decided to try an OCF Dipole (aka Windom). The benefit of this is that it exhibits good multiband performance without taking up much more room than a random length of wire and without the need for ground planes etc. I did quite a lot of research on which design to go for as there seems to be lots of (dis)information on the Internet about this particular antenna type. I finally settled on W8JI's design for an OCF dipole with the long leg being 80% and the short one 20%. The website describing his design is here. There were a number of reasons for opting for this design, firstly it fit better in my location as it allowed me to use the pole mounted to the rear of my house as the feedpoint, run the long leg to the trees at the end of the garden and the short leg over the roof (attached at the front of the house). 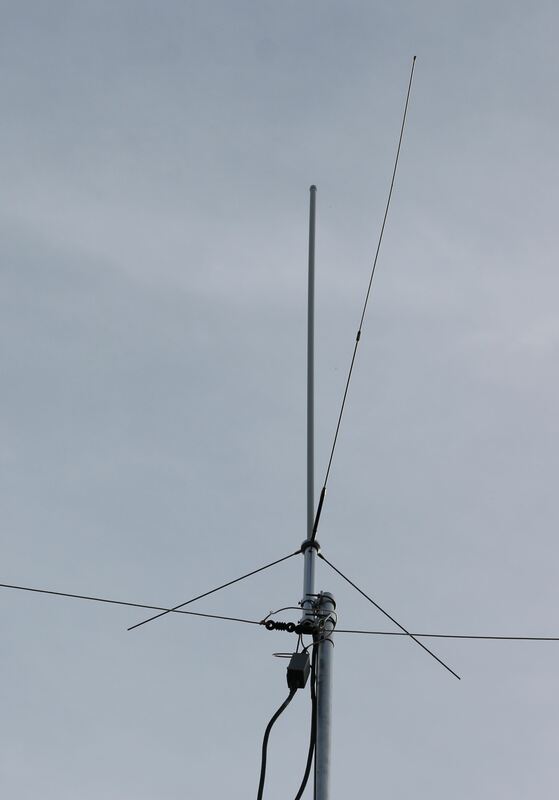 This design also makes the antenna have a "resonable" SWR on more bands than the traditional OCF dipole ratio of 66%/33%. With my initial tests, I had a cheap 4:1 voltage BalUn and the performance was OK but I did start to notice that I was getting RF in the shack. This seemed to be particularly obvious on digital modes (PSK31/JT65a) on 40m where my laptop would 'lose' the USB connection to my IC-7100 during long transmissions forcing me to manually stop the transmission. I also noticed that the SWR wasn't particularly great and was "missing" certain bands. Having read somewhere that a voltage balun on an OCF dipole can exhibit different characteristics when connected to an antenna analyser compared to actually transmitting I wasn't too concerned about this especially as I still managed to work China and the USA on JT65a with it! After LOTS more research on BalUns and looking at various different designs, I decided to try a "proper" Current BalUn. All of the reviews and many of the websites seemed to agree that Bob at http://www.balundesigns.com was the king of BalUns so I had a look at his website. There are a number of different designs but one that caught my eye was the #4155ocf as that was designed specifically for OCF Dipoles and as it has a high choking impedance this should eliminate the RF that I was seeing coming back into the shack. As soon as I picked-up the "Jiffybag" that the BalUn was shipped in, I could tell it was going to be well made (it was heavy!) The unit itself comes with an eyebolt on the top and both sides with crimp tags on the side eyebolts for connection to the antenna and an SO239 socket on the base. This seems to be a particularly long article considering I have only just got the "actual" subject, maybe I should rename it? Anyway I dropped my antenna down (thankfully I had installed everything with pulleys so it came down nice and easy) and I connected the new BalUn in place of my old Voltage unit. The SWR plot with the new BalUn is quite different but with the exception of 30m where it seems to completely miss the band, the lowest SWR is at least within all of the bands, including 80M where it is lowest at the very top. 160M has disappeared but I was never really expecting it to work that low down the spectrum anyway. 20m is certainly better but slightly disappointing as it seems to be about 4.3:1 across the whole band. I did some actual testing with my ATU disconnected and the SWR on most of 20m (according to the SWR meter in my IC-7100) was more like 2.8:1 but after reconnecting my ATU it happily tuned across the whole band. With my previous antennas (random wire and OCF with voltage BalUn) I have been a bit disappointed by the level of noise on both 20m (about S4) and 40m (S7+) with 80m being pretty much S9 unusable apart from with VERY strong signals. I spent a fair amount of time trying to eliminate local sources of QRM and discovered a faulty z-wave dimmer seemed to be the cause of much of the noise so I ditched my z-wave experiment however the QRN/QRM was still annoyingly high.It may be psychological but it appears that the noise levels have reduced since installing the Balun Designs unit. Depending on the time of day, I now see S2-3 on 20m and about S5 on 40m with slightly higher levels on 80m. All in all, I am happy with the combination of OCF Dipole and #4155ocf BalUn and hopefully will be able to get some real world results in the next few days. I used the exact dimensions for the "legs" of the antenna from W8JI's article and while I was prepared to have to 'tune' the antenna, I think that I may struggle to get better results than the ones that I am currently seeing but maybe time will tell?